It was an interesting experience searching for tickets for my return journey from Pune. The conference I was attending was getting over on Sunday in the afternoon, and my presentation was scheduled for Sunday morning. Since I decided to go for the conference quite late, my options were quite limited. While browsing on different ticketing websites, I came across a low fare ticket on Air India - the good ol' Maharaja of Indian skies. I quickly cross checked the rates on the Air India website, and confirmed the rates did exist. 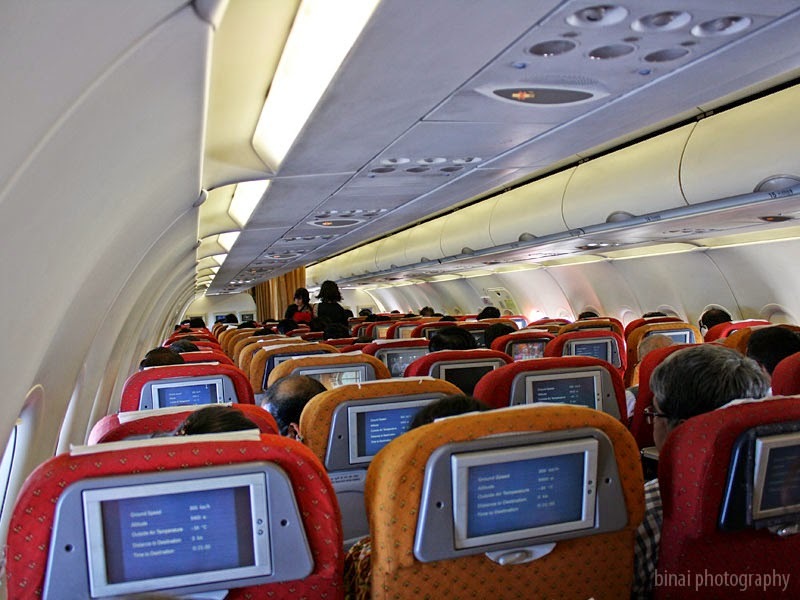 I hadn't flown on Air India for quite some time, and I haven't flown an Airbus A319 as well. Booking on this flight was a no-brainer decision. The departure time from Pune (1535hrs) was a bit of worry though - the program ends only at 1330hrs. I decided to book the ticket after I checked the distance between the conference venue and the airport. While at the conference venue, I booked for a cab pick-up at 1300hrs. With the airport just around 20kms away, and being a Sunday afternoon, I was sure I'd be able to reach there with enough time to spare. My presentation finished later than expected, and I had to really rush with my lunch. Just as I finished my lunch (sharp at 1300hrs), the cab driver calls up and drops a bomb - that he would not be able to turn up at the appointed time. The conference venue was on the outskirts of the city, and transportation options from there were really really limited. I was a bit worried, and skipped a few heartbeats, no doubt. I called up the call-centre of the cab operator - but they were helpless as well - unsatisfactory responses, and an indifferent attitude. It was then a mad hunt for cabs - and finally a local cab operator - TCabs - agreed to send a cab and promised that the car would drop me at the airport before 1415hrs. 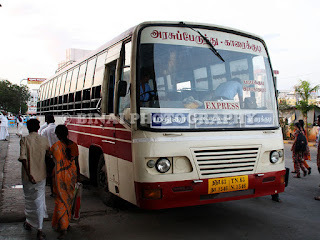 The cab turned up at 1330hrs, and the driver confirmed my flight timings before he hit the road. A good driver, who really understood my emergency, and he drove very smart, speeding up whenever situation permitted. He dropped me at the Airport at 1407hrs - with enough time to go for check-in limits. The driver refused any tips and collected just the meter fare. TCabs would certainly be my operator of choice when I go to Pune again. Pune Airport is a very small airport - seriously too small for a city like Pune. The departure area was chocked - I realised later that there were no less than 4 departures at that time! 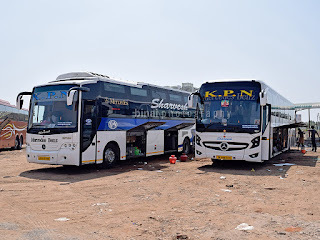 There was a long queue at the entrance to the terminal area - the CISF guards at the entry were going about checking each ticket at a very leisurely pace. Once inside the terminal, there was another round of CISF checking, where tickets and IDs were verified again. The guard here directed me to the Air India check-in counter, which was among the counters closer to security check. My check-in baggage was scanned and a sticker put on my bag certifying it was checked. There was absolutely no-one at the check-in counter, and I got my boarding pass by 1415hrs. Security check was a bit messy - long disorderly queues - with people jumping lines at their will. Thankfully, I passed checking by 1425hrs and headed towards the security hold in the first floor of the terminal. While I walked out of security check, an Indigo A320 (VT-IFE to Ahmedabad) took off. No gate number was mentioned on the boarding pass - so just followed the crowd. The terminal area was quite crowded - I got a seat closer to the air-side and sat down watching some action. I switched on my laptop and remained glued to FR24 tracking the whereabouts of my aircraft. 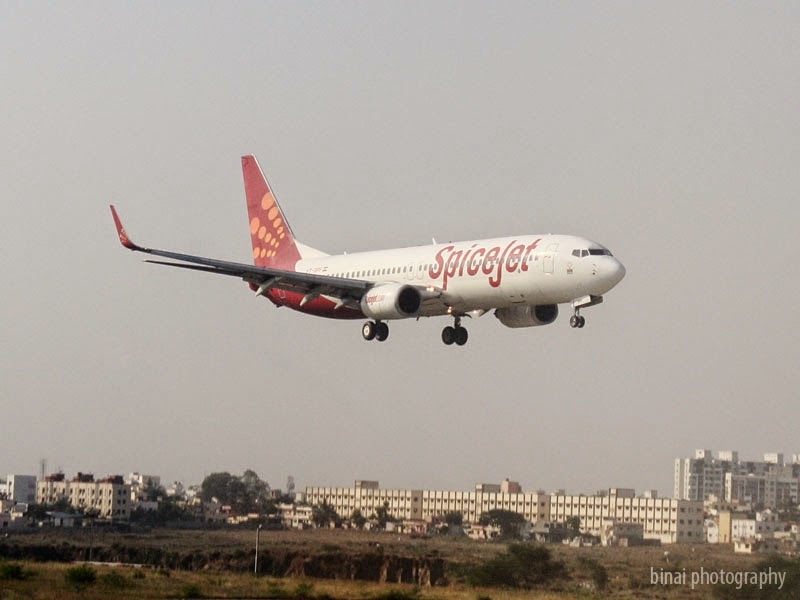 The aircraft (VT-SCP) works Goa-Pune-Hyderabad-Bangalore, and it was flying over Satara at that point of time - The aircraft was expected to land in Pune in another 25 minutes. A Jet Airways aircraft (VT-JFJ) was also approaching Pune. In the meantime, a Jet Airway ATR72 to Indore was boarding (could not note the regn). A private jet, Bombardier Global 5000, marked "Bajaj" (VT-KJB) was pushed out at this time - it remained on the apron for quite sometime, while another private aircraft, a Beechcraft B200, (VT-LKK) headed to the runway for takeoff. The Beechcraft was made to hold for a while, to let VT-JFJ of Jet Airways working 9W-2847 to land. The Beechcraft took off soon after. The Bajaj owned Bombardier was made to hold for my aircraft - VT-SCP to land (1453hrs). Soon after SCP landed, VT-KJB was cleared for take off. It was not until 1511hrs that boarding was called - the boarding gate was at the other end of the terminal, the opposite end of where I was seated. In the meantime, a long queue had already formed. We were boarding from Gate #2 (a Jetway gate). It was a long walk from the waiting area to the aircraft - I was among the last passengers to walk in. 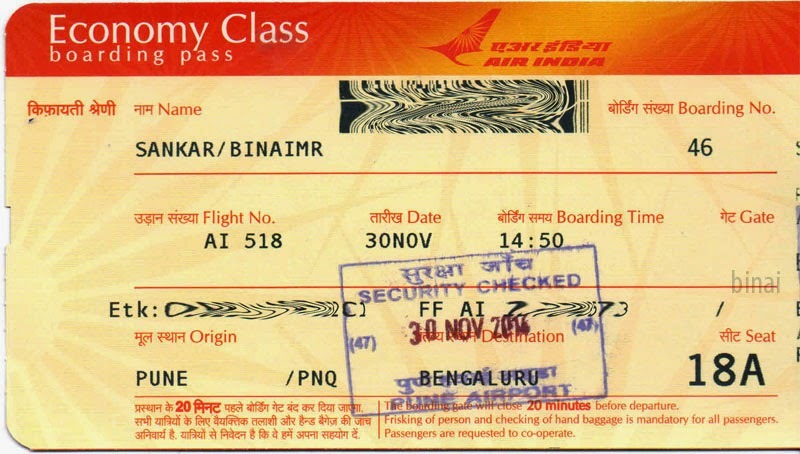 Boarding passes were checked again before we were permitted into the aircraft - Air India security personnel were performing the checks. Boarding finished by 1523hrs, and the aircraft was pushed back at 1525hrs. A quick welcome briefing was done by the chief of cabin crew - who introduced herself was Ms Menon. The deck crew was headed by Captain Chandrashekhar (who flew me through to Bangalore). Security demonstration was played on the IFE screens - a slow and relaxed presentation, which actually let passengers understand the instructions quite clearly. We began our taxi at 1529 and was held short of the runway at about 1531hrs. 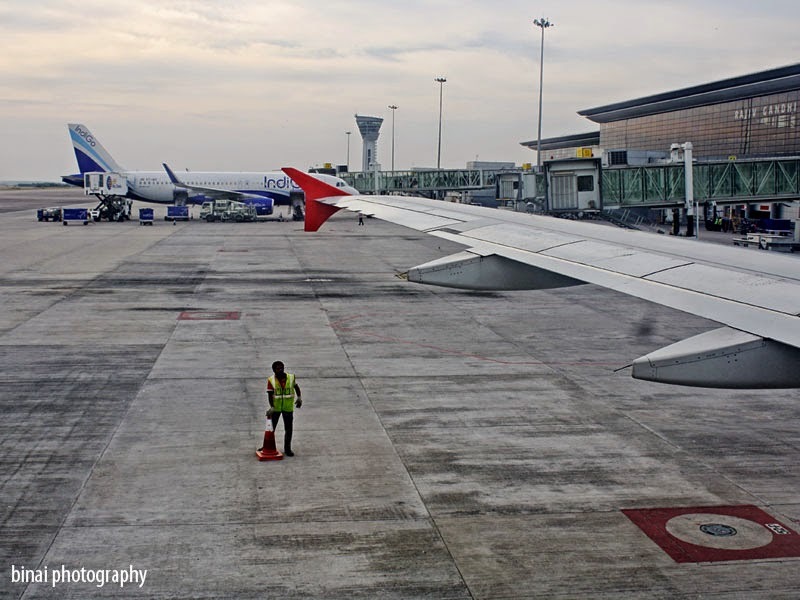 A SpiceJet B738 (VT-SPF) landed - came in from Kochi? We finally moved over to the active runway (Rwy10) at 1534, and took off at 1536hrs. In-Flight service in the first leg. The IFE had a couple of movies and a live map - I did not ask for the headphones and preferred looking out and reading the in-flight magazine - Shubh Yatra instead. 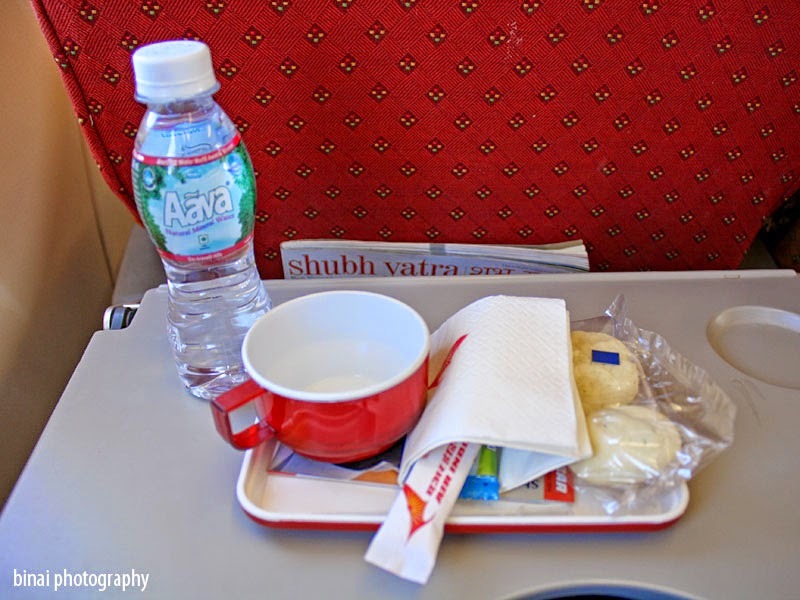 In-flight service soon after the seatbelt sign was switched off. They served a couple of cookies, and a hot beverage. 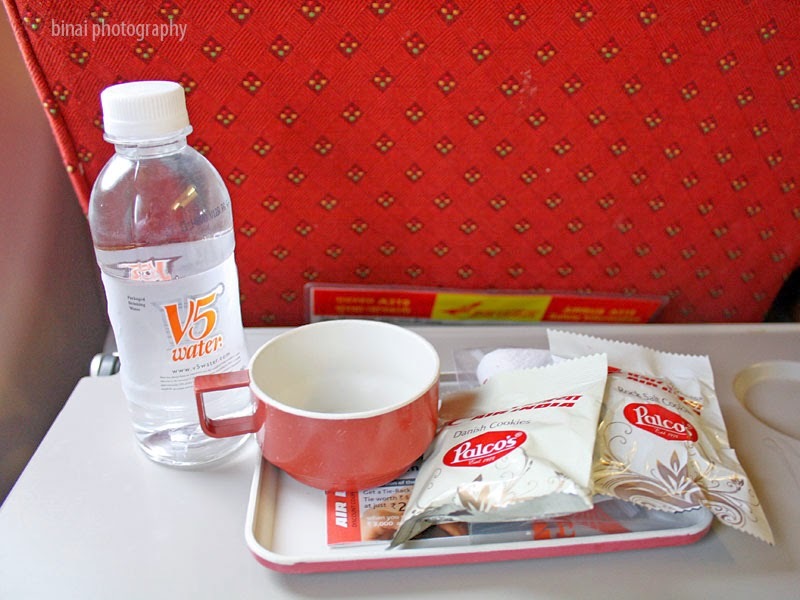 The jugs used to serve Tea/Coffee still had the "Indian Airlines" embossed markings. I opted for coffee. This sector was largely uneventful. Landing was announced at 1609hrs. The purser was making all the announcements - she was talking a bit too fast to be comprehended. We touched down at 1621hrs on Rwy09. 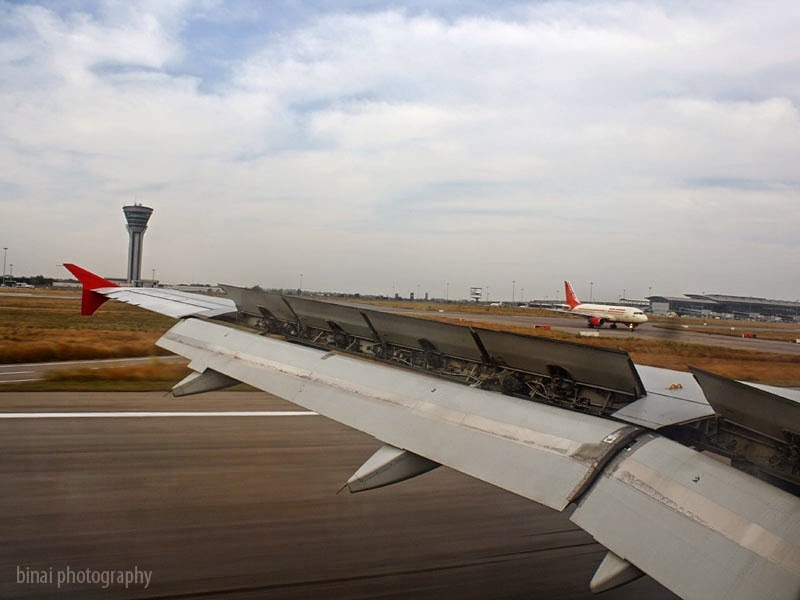 As we landed, an Air India A319 was ready to take off. We parked at a Jetway stand at the terminal, at 1625hrs. 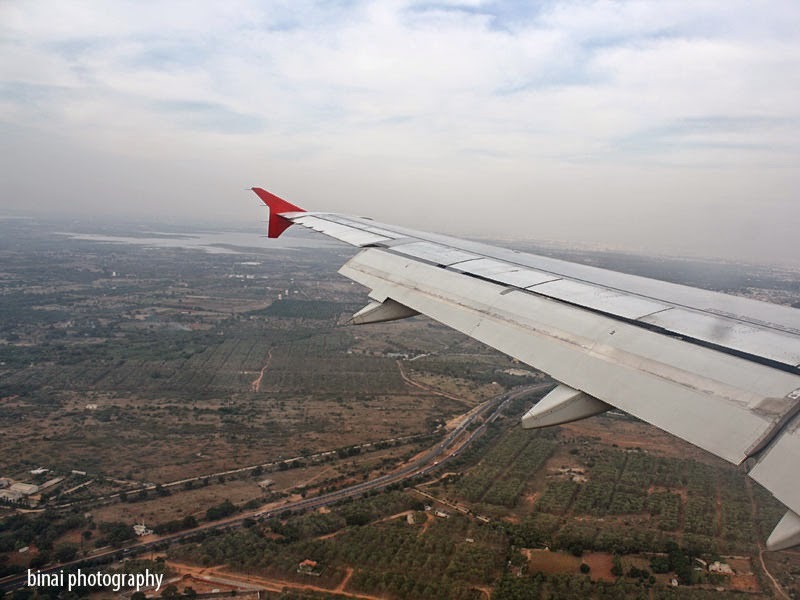 The purser announced that we were expected to be on the ground for 35 minutes and that all passengers continuing to Bangalore are to remain seated. Soon after the aircraft was parked, a ladder was connected to the rear exit, and housekeeping staff were all set to barge in. 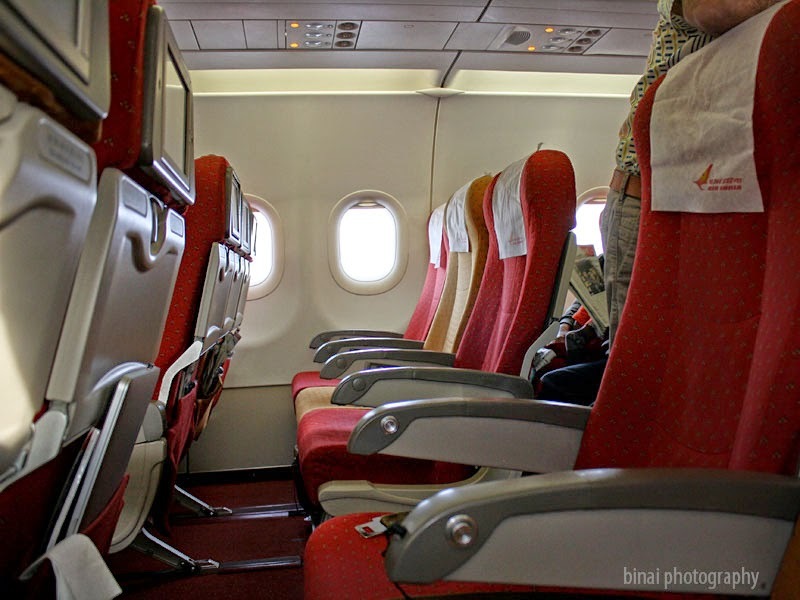 The aircraft almost emptied out at Hyderabad - about 20-odd passengers remained in the aircraft. As soon as the passengers alighting in Hyderabad cleared out, the housekeeping staff came in and began their work. 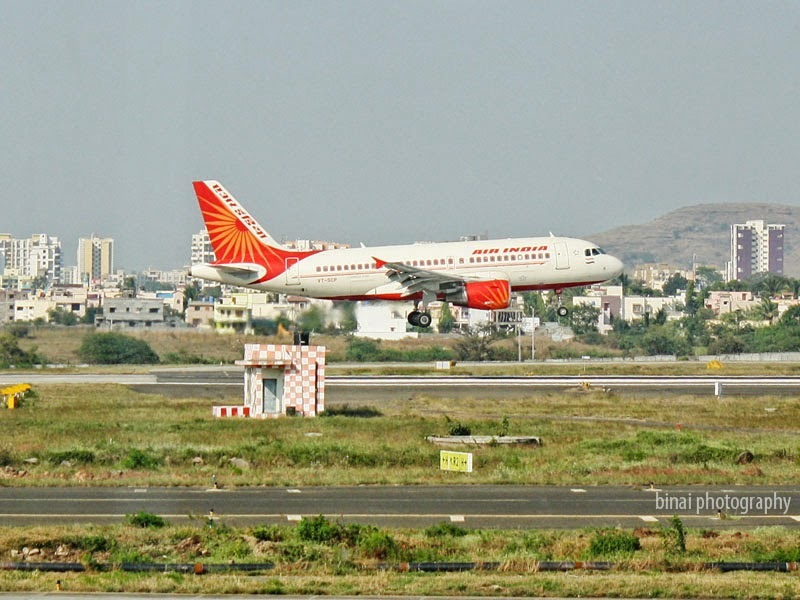 An Air India security personnel came around for identification of hand baggage, while housekeeping staff came around collecting bottles and leftover items left in seat pockets. Sometime later, an AirIndia staff came and verified boarding passes. A new set of cabin crew joined us here. In both the legs, there were two each of male and female cabin crew. 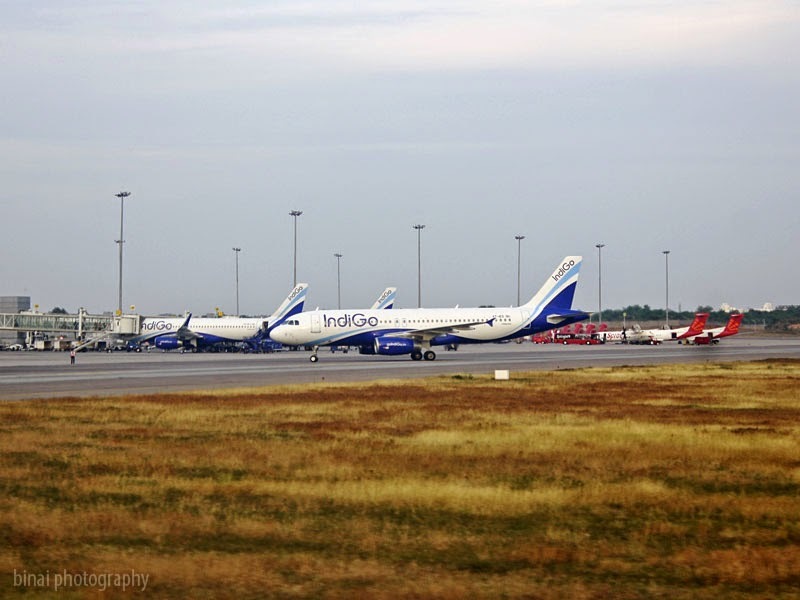 The apron was packed with Indigo aircrafts. 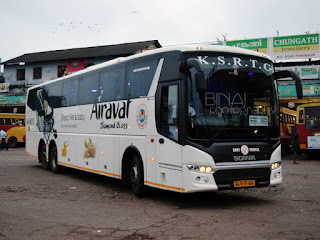 Infact, we had one on each side of our aircraft - VT-IAS was on the port side. I couldn't notice the regn of the aircraft on the starboard side. There were two SpiceJet Q400s at the remote stands as well. 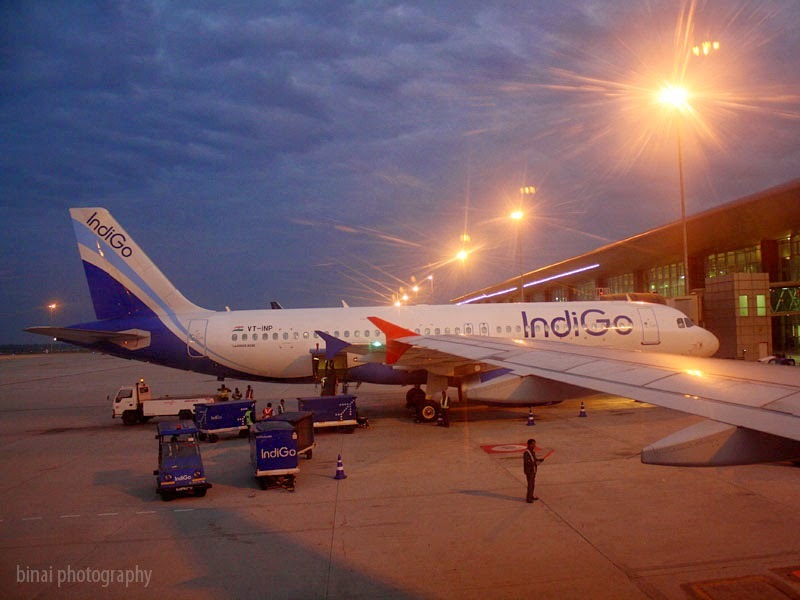 The first passenger boarding from Hyderabad came in at 1643hrs. Boarding was completed at 1654hrs - we were full again. The new cabin crew now welcomed all the passengers - Captain Chandrashekhar was continuing on to Bangalore. We were pushed off at 1658hrs. The safety demonstration video was being played out in during this time. We taxied out at 1702hrs. 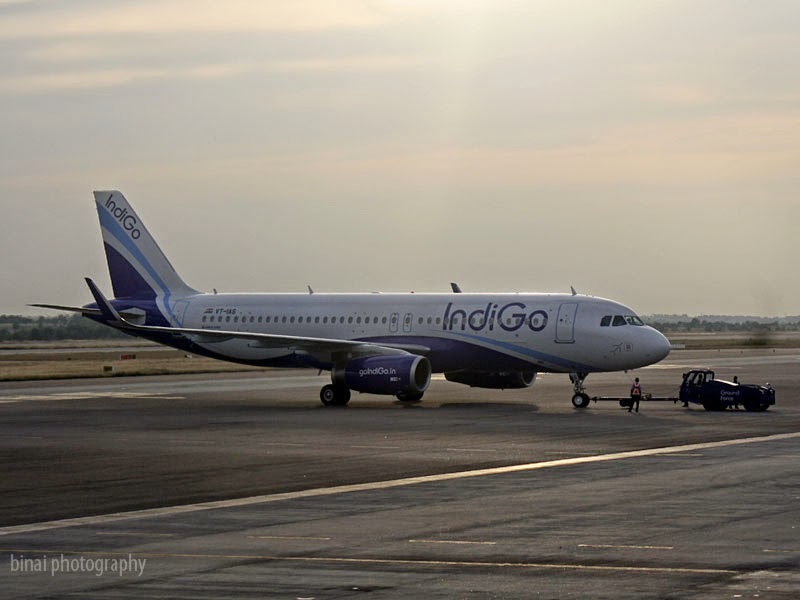 As we started taxiing, Indigo's VT-IEG came in. We headed towards Rwy09, and took off at 1705hrs. 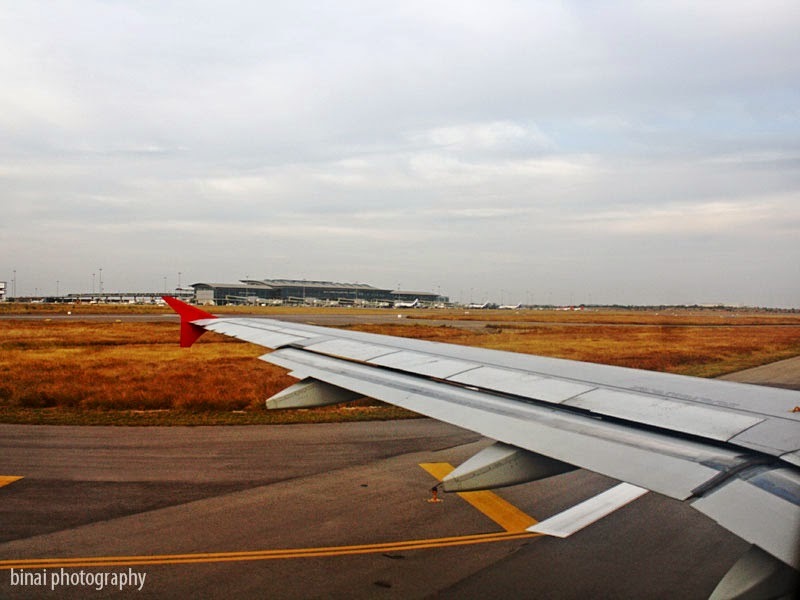 While taking off, I spotted an ATR72 painted in Air Pegasus livery and an Air Asia A320 parked at the MRO Hanger. We took off towards the east and turned around to align to our South Western direction. 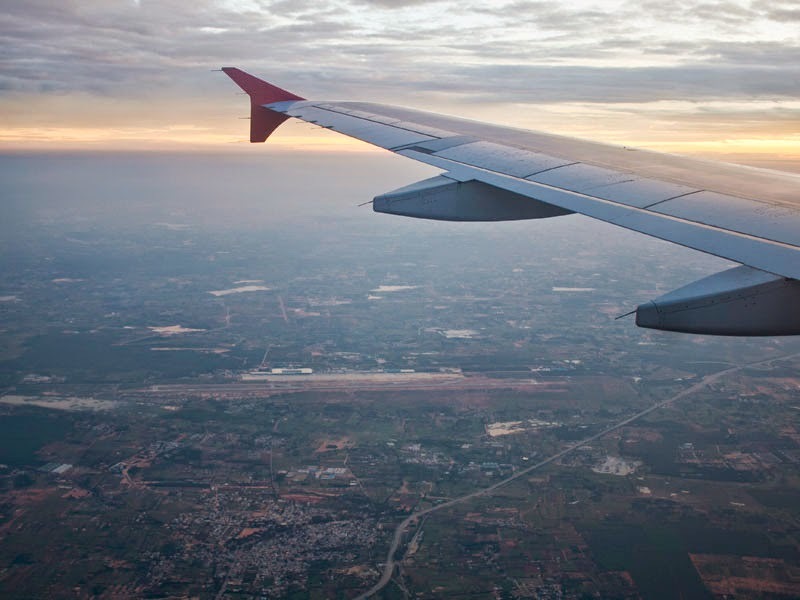 Soon after the seatbelt sign was switched off, in-flight service started off. I was a bit hungry now, and wanted something good to eat. The trolley came close - my tray was handed over. Sigh! It was cookies again! This time, the cookies were packed better though, and there were two pieces each of sweet and salted cookies. I opted for coffee again - and the coffee tasted better this time (could be because I was too hungry as well). For some reason, the cabin crew on this leg were mechanically serving the passengers - they just hurried through the service. 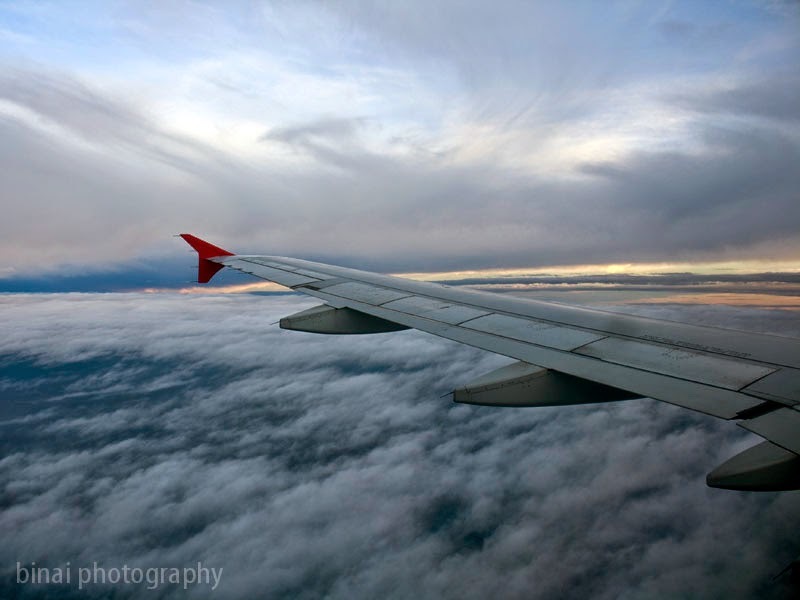 Soon after the service was over, the aircraft ran into somewhat turbulent weather - the seatbelt signs came on, and an announcement was made about the turbulent weather as well. There was fairly thick cloud cover, and it was a marvellous experience flying between clouds in the backdrop of a setting sun. My co-passenger was perhaps flying for the first time - she was quite curious about the scene outside, and requested me to get a couple of pictures on her phone. 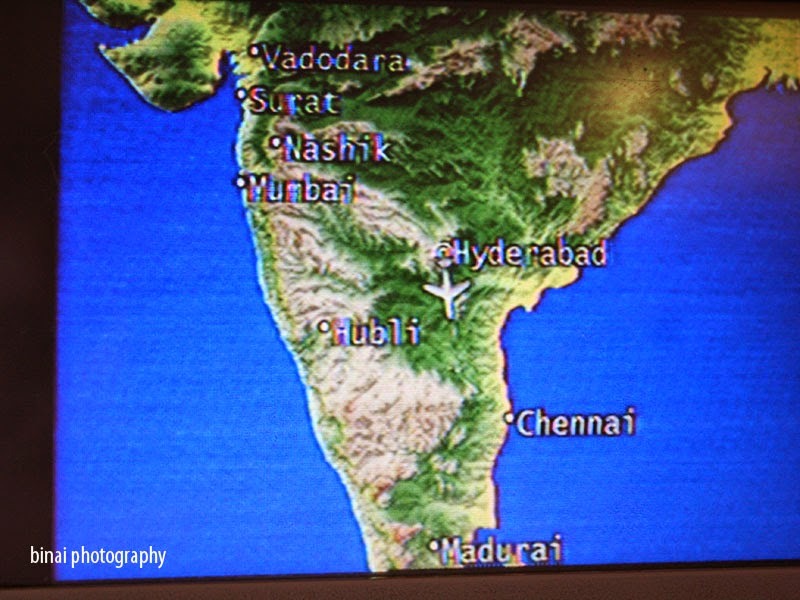 The moving map on the IFE - but where is the destination, Bengaluru? Landing was announced at 1744hrs - the seatbelt sign was already on. 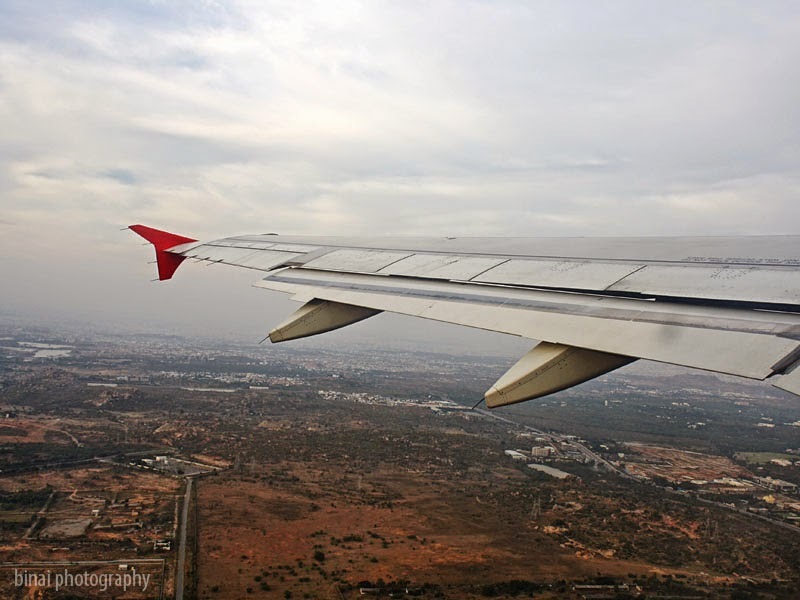 We flew past Bangalore airport, headed towards the west. We flew for quite some time before we turned back to align to the landing path. 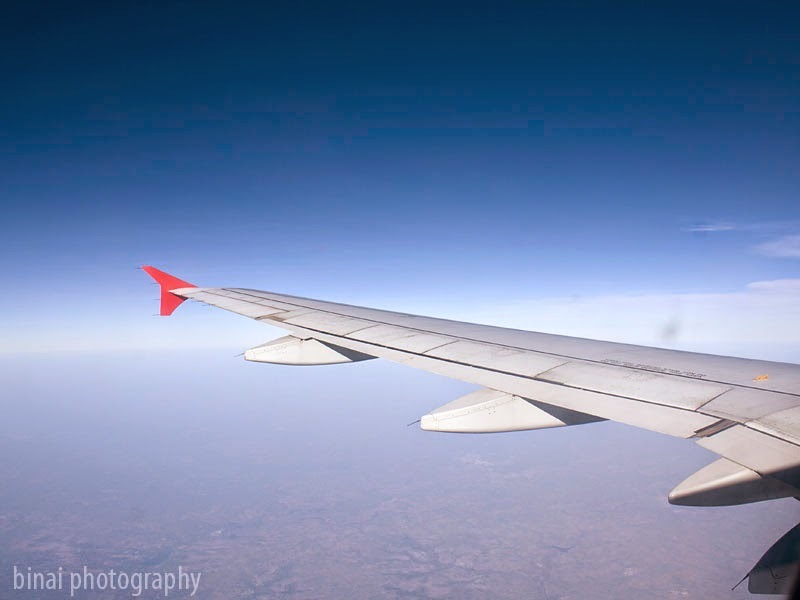 While we were yet to turn around, I saw another aircraft far away on its finals approaching Bangalore. 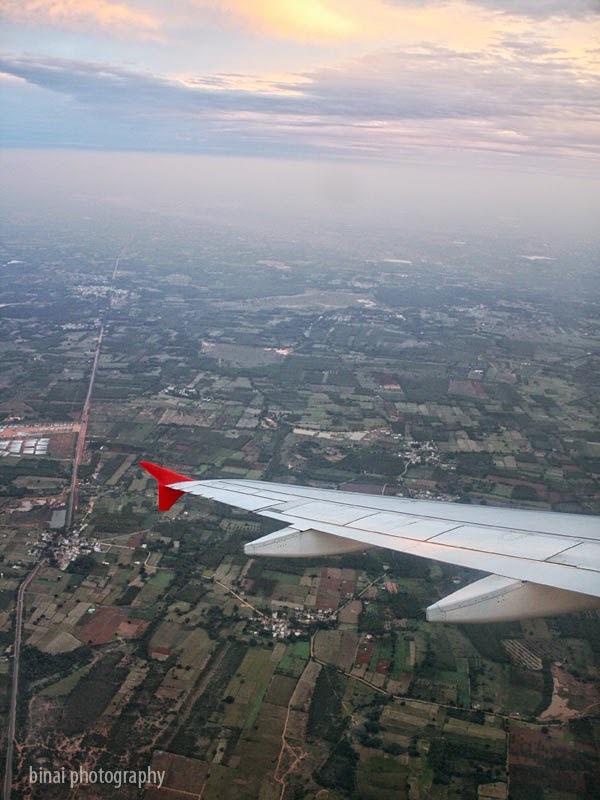 We turned around, letting me have a better view of the setting sun, and aligned to land at Bangalore. We finally touched down on Rwy09 at 1800hrs. Soon after we cleared the active runway, the purser came on the PA system, and announced our arrival - she thanked all passengers for flying "Air India, a member of Star Alliance". Announcements on this sector were more comprehensible compared to the earlier sector. It appeared that we landed at a non-peak hour at Bangalore - most of the jetways were vacant - we finally parked at Stand #20 at 1803hrs - it took sometime for the jetway to be attached. But the impatient Indians we are, people had already formed a long queue to get off the aircraft. I waited till the crowd subsided a bit, and I walked out of the aircraft at 1810hrs - the cabin crew gave a nice smile and the traditional Namaskaar to each passenger getting off the craft. It took some time for the baggage to arrive, and I was finally out of the airport at 1819hrs.